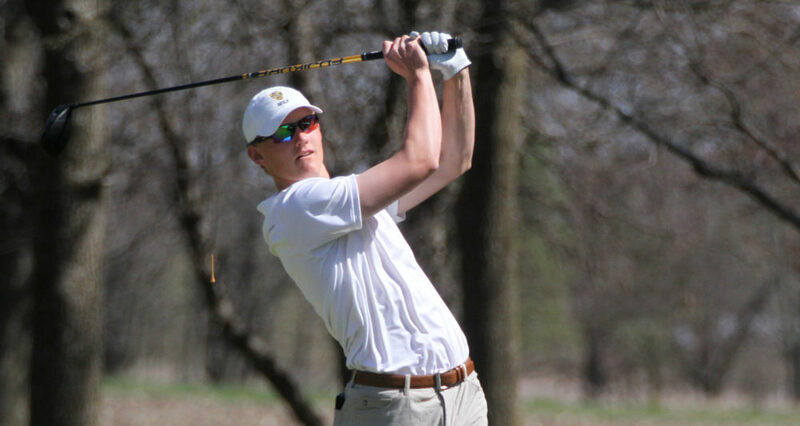 LE SUEUR, Minn. – The Gustavus men’s golf team won its first home meet of the spring season Friday at the Le Sueur Country Club. The Gusties carded a 291 (+11), seven strokes ahead of second place St. Thomas, who is ranked first in the nation according to the Golfstat Top 25 ranking. Alec Aunan (Sr., Rock Island, Ill.) took second place on the par 70 course, shooting a one-over 71. Ben Hauge (So., Ramsey, Minn.) was a stroke behind to tie for third place. Chris Captain (Sr., Rochester, Minn.) placed sixth with a score of 73. Max Ullan (Fy., Blaine, Minn.) and Joe Foley (So., East Gull Lake, Minn.) rounded out the top team with scores of 75 and 77, respectively. Christian Thoen (Dawson, Minn.) led the second team, posting a 72 to tie for third place. The Gusties host their final meet of the season Saturday at New Prague Golf Course – another one-round event. Check back later for video highlights of the event.